Associate Dean Pamela McCoy introduced the three Quinlan professors who spoke at the inaugural Q Talks: Live! event. 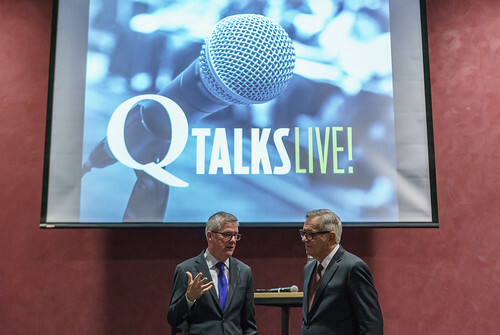 In November, Quinlan alumni and friends gathered for the inaugural Q Talks: Live! event featuring three Quinlan faculty offering unique insights and ideas based on their research. Associate Dean Pamela McCoy moderated the event, and Dean Kevin Stevens welcomed attendees. Q Talks is part of the Dean's Alumni Series. The second Q Talks: Live! is scheduled for April 24, 2019. View Q Talks photos in the gallery below or on Quinlan’s Flickr page.